Galician Hebrew and Judæo-German writer; born at Drohobycz c. 1850. In addition to editing the "Drohobyczer Zeitung," a Judæo-German weekly begun in 1883, and the "Ẓiyyon," a periodical which was at first devoted to Hebrew literature (irregularly from 1885 to 1888) and later became a monthly scientific publication (1896-97), Zupnik published the following works: "Ḳedushshat ha-Shem" (Brody, 1867), a historical novel depicting Jewish life in Spain and adapted from Ludwig Philippson's "Jacob Tirado"; "Toledot Abraham" (Lemberg, 1869), biography of Abraham Cohn, a preacher of Lemberg; "Emet u-Mishpaṭ" (Drohobycz, 1883), a Hebrew translation of Joseph von Wertheimer's "Jüdische Lehre und Jüdisches Leben" (also published in Polish under the title "Nauka Zydowska"); "Vom Ḥeder zur Werkstätte" (ib. 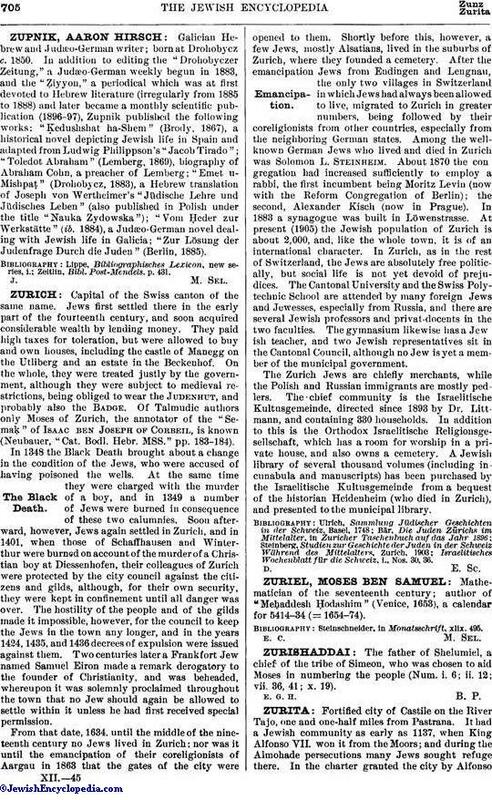 1884), a Judæo-German novel dealing with Jewish life in Galicia; "Zur Lösung der Judenfrage Durch die Juden" (Berlin, 1885). Zeitlin, Bibl. Post-Mendels. p. 431.